The Xwindow interface on EusLisp becomes available when EusLisp is invoked by the name of 'eusx'. 3The "DISPLAY" environment variable should be properly set to your Xserver, since eusx tries to connect to Xserver referencing the "DISPLAY" environment variable when it starts up. EusLisp defines three levels of xwindow interface: (1) Xlib functions, (2) Xlib classes, and (3) XToolKit classes. All the xwindow functions described in this section and the following XToolKit section are contained in the "X" package. The function names of the original Xlib are changed so that all constituent letters are converted to upcase and the first 'X' prefix is removed. For example, XdefaultGC is named X:DEFAULTGC, not X:XDEFAULTGC. The Xlib functions are defined as foreign functions as the lowest level interface to Xwindow system. These Xlib functions should be used carefully, since parameter type check or parameter number check is not performed. For an instance, all the Xlib call requests x:*display* argument to identify the connection to Xserver, and if you forget it, Xlib reports an error and the process dies. The second level interface, Xlib classes are provided to avoid this inconvenience and to make the interface object-oriented. This section focuses on this second level interface. Even higher level xwindow library called XToolKit is explained in the next section. Classes described in this section have the following inheritance hierarchy. default foreground pixel referenced at window creation, normally *blackpixel*. the default gcontext referenced at pixmap creation. GC whose foreground color is white. GC whose foreground color is black. 16x16 pixmap, a quarter of pixels are *fg-pixel* and three quarters *bg-pixel*. 16x16 pixmap, a half of pixels are *fg-pixel*. 16x16 pixmap, three quarters of pixels are black. 25% gray GC made from *gray25-pixmap*. 50% gray GC made from *gray50-pixmap*. 75% gray GC made from *gray75-pixmap*. a list of all windows including subwindows created and maintained by EusLisp. a hash table to look up the xwindow object by its drawable ID. In the event structure obtained by x:nextevent is a window ID, and x:window-main-loop calls x:event-window to know the corresponding xwindow object using this table. sends all commands retained in the Xlib command buffer to Xserver. Since Xlib buffers output to Xserver, commands you issued commands to Xserver are not executed immediately. This is necessary to decrease network traffic and the frequency of process switching. To flush the command buffer to see the effects of the commands, use xflush or send :flush message to xwindow objects. Each xwindow may have name specified at the creation time. Find-xwindow looks in the *xwindows* list and returns a list of windows that have 'subname' as a substring of its name. The common super class for all the Xwindow related classes. Currently, no slots variables and methods are defined. Xdrawable defines rectangular regions where graphics objects such as lines and strings can be drawn. Xdrawable is an abstract class to define common methods for xwindow and xpixmap, and instantiation of this class has no effect. Id is set to the drawable slot as the ID of this drawable. A new GC (graphic context) is created and set to gcon as the default GC of this drawable object. flushes commands retained in the Xlib's buffer. returns the list of seven geometric attributes, root-window-id, x-position, y-position, width, height, border-width and visual's depth. returns the height (dots in y direction) of this drawable. returns width (dots in x direction) of this drawable. If no newgc is given, the current gc object is returned. If newgc is an instance of gcontext, it is set to the gc of this drawable. Otherwise, newgc is regarded as a message and sent to the current gc. returns an integer vector representing the position of this drawable. The position is always defined relative to the parent window, and windows created as direct subwindows of the root window under the intervention of the window manager return the constant coordinates in their surrounding title window regardless to their true position in the root. returns the x coordinate of this drawable relatively to the parent window. returns the y coordinate of this drawable relatively to the parent window. Drw is another drawable object (xwindow or pixmap). 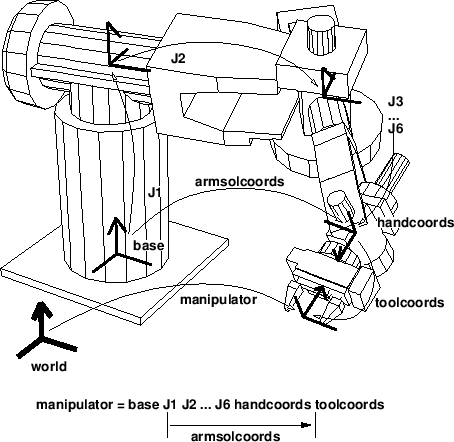 The contents of drw is copied to this drawable. draws a point at with optional gc. draw a line from (x1, y1) to (x2, y2) with optional gc. x1, y1, x2, andy2 must be integers. draws a rectangle whose center is located at (x, y) and size is specified by width and height. draws an elliptic arc whose center is (x, y) and starting angle at angle1 and ending angle at angle2. Angles should be given by radian. fills in a rectangular region. displays the string str starting at (x, y). The background is not filled. displays an imagestring of str. Imagestring fills background. gets ximage from the server and returns the pixel data in a string. The pixel data sent from the server is once stored in Xlib's ximage structure, then copied to the string row by row. The ximage structure is automatically destroyed. The image string obtained by :getimage can be used to make a pixel-image, which can be written to a file in the pbm formats as described in section 18.6.
puts image to the specified location in this drawable. 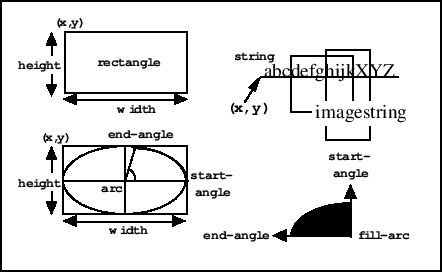 image is a string or a address pointing to an ximage structure. is same as :line method, and provided for the compatibility with other viewsurface classes. sets line-width of this drawable's default GC. Use of the :gc :line-width message is recommended. sets line-style of this drawable's default GC. Use of the :gc :line-style is preferable. sets color of this drawable. clears a rectangle using the :fill-rectangle method. Pixmap is a drawable that is often used as a picture buffer or a background pattern. Unlike xwindow, pixmap itself is not visible until it is copied to xwindow or pixmap does not generate any event. creates a width x height pixmap with gc as its default GC. creates a pixmap from a bitmap file. writes the contents of this pixmap into a bitmap file, which can be read back to create a pixmap by :create-from-bitmap-file method. destroys this pixmap and frees X resources. Xwindow defines visible rectangular regions of the screen. It is inherited not only by text-window and canvas where any graphics objects can be drawn, but also by many panel-items and scroll-bars, which look like graphics objects rather than windows. creates and initializes a xwindow. When parent is given, this window is created as a subwindow of parent, and is registered in the subwindows list of the parent. X, y, size, width, height and border-width determine the location and the dimensions of this window. Save-under and backing-store control the Xserver's behaviors taken upon when the window is re-mapped. Save-under is either T or NIL, while backing-store is either :notUseful, :WhenMapped, or :Always. When backing-pixmap is T, a pixmap of the same size as this window is created by EusLisp, and maintained as a backing-store in case the Xserver does not have the capability of backing-store. Border and background specify the border_pixel and background_pixel attributes, respectively. Map should be set NIL, if this window should not appear immediately after its creation, as is the case many small windows are created as panel-buttons in a panel. Title is the window title which appears in the title bar of the window. Name is the name of the window stored in the property-list of this xwindow object and printed by the printer. X's events reported to this window are determined by Event-mask, that is, either an integer representing a bit-coded event-mask or a list of the following symbols: :key, :button, :enterLeave, :motion and :configure. If more precise control is needed, the following symbols for each event can be specified: :keyPress, :keyRelease, :ButtonPress, :ButtonRelease, :EnterWindow, :LeaveWindow, :PointerMotion, :PointerMotionHint, :ButtonMotion, :KeyMapState, :Exposure, :VisibilityChange, :StructureNotify, :ResezeRedirect, :SubstructureNotify, :SubstructureRedirect, :FocusChange, :PropertyChange, :ColormapChange and :OwnerGrabButton. :Key enables both :keyPress and :KeyRelease, and :button enables both :ButtonPress and :ButtonRelease. When an event is sent from the server, window-main-loop analyzes the event structure and send the :KeyPress, :KeyRelease, :buttonPress, :ButtonRelease, :EnterNotify, :LeaveNotify, :MotionNotify, :ConfigureNotify message to the window where the event occurred. makes this xwindow and all the subwindows visible. makes this xwindow and all the subwindows invisible. Event-mask is either an integer or a list of eventmask symbols. Each event corresponding to the bit turned-on or enumerated in the event-mask list becomes to be reported to this window. destroys this xwindow and frees X resource. The corresponding entries in *xwindows* and *xwindow-hash-tab* are also deleted so that this window object could be garbage-collected. All subwindows are also deleted by sending :destroy. This window is dissociated from the subwindow list of the parent window. The drawable ID is set to NIL. returns the parent window object. returns the list of all the subwindows. The subwindow most recently created comes first in the list. Only the direct subwindows of this window are listed and subwindows of the subwindows are not. register the child window as a subwindow of this window. removes the child window of the subwindows list. changes the title of this window. Though the title is in the Xserver, it is maintained and displayed by the window manager. returns an integer-vector representing the attributes of this window. returns the visual resource id for this window. returns the screen resource id for this window. returns the root window id. returns a two dimensional integer-vector describing the x and y coordinates of this window. returns the depth (number of color planes) of this window. returns the size (width and height) of this window. returns colormap resource id for this window. changes the location of this window to (newx, newy). The coordinates are given relative to the parent window. changes the size of this window. Probably because the size parameters are cached in the Xlib on the client side, :geometry message immediately after :resize may return wrong (old) result. pushes this window to the back. changes the background pixel value (the index in the color map) to pixel. The pixel value is also stored in the bg-color slot. :Clear operation is performed to fill the current background with the specified pixel. changes the background with given pixmap. sets the color of the border to pixel. clears the specified rectangular area of this xwindow. is the first function to call when eusx start up. Init-xwindow connects to the Xserver specified by display, and initializes default variables described in the section 20.1. Init-xwindow also loads default fonts and sets them to global variables, such as font-courb12, lucidasans-bold-12, etc. This font loading causes the delay at the start-up time. Reduction of the number of fonts loaded or specifying the exact font-names without using the wild-card character "*" will shorten the delay. defines the graphic context. In EusLisp, every xwindow has its default GC. creates a gc with given attributes. Drawable is used by the Xserver to know the screen and depth of the screen. The resulted GC can be used in any drawables as long as they are created on the same screen. makes a copy of this GC. if color is given, it is set to the foreground color. Color is a pixel value. if color is given, it is set to the background color. Color is a pixel value. sets foreground and background colors at once. :XorReverse, :CopyInverted, :OrInverted, :Nand, :Set. sets the font attribute of this GC. X is either a font-name or a font-ID. If x is a font name (string), :font calls x:LoadQueryFont to decide the font-id. If not found, "no such font ..." is warned. If x is NIL (not given), the current font-ID of this GC is returned. sets the line width in pixel. sets the line-style (solid, dashed, etc.). Each component of X is an integer. :Dash sets the dash pattern of the line-style. sets the tile of this GC to pixmap. sets the stipple of this GC to pixmap. gets attribute. Attr is one of :function, :plane-mask, :foreground, :background, :line-width, :line-style, :cap-style, :join-style, :fill-style, :fill-rule, :font. An integer value representing the attribute is returned. change attributes. More than one attributes are changed at the same time. If fontname is integer, it is returned regarding it as font-id. If fontname is string, font-structure is inquired by using x:LoadQueryFont, and its font-id is returned. Fontname can be a shorthand of exact name, such as "*-courier-24-*" for any 24-point courier font. If the font could not be found, can't load font warning is printed. returns a list of three integers representing (ascent descent width) of the str (string) in dots. defines an xwindow colormap and application oriented color look-up tables. A color is represented by RGB values from 0 through 65535. Color cells in a color map are addressed by their indices, which are between 0 and 255 on 8-bit pseudo color display. Here we assume your display device has 8bit pseudo color capability which allows you to choose 256 colors at the same time. Basically there are two ways in the use of color maps: to share the system's default color map or to create private color maps. If you use the system's default color map, you have to be careful not to use up all the color cells in the map, since the map is shared among many processes. If you use private color maps, you can allocate all 256 color entries in the map without worrying about other processes, but the map has to be explicitly attached to your private windows. The color map is activated by the window manager when the mouse pointer is moved somewhere in the window. The system's default color map is set up in x:*color-map* which is an instance of the x:colormap class when eusx begins execution. If you use private color maps, you create instances of x:colormap. These instances correspond to the colormap object defined in the x server and are identified by the cmapid stored in each instance. When you use the system's default color map, you can define read-only colors which are shared with other processes or define read-write colors which are private to your EusLisp. Read-only means that you can define arbitrary color when you allocate the color cell, but you cannot change it after the allocation. On the other hand, read-write colors can be altered even after you defined them. Shared colors are read-only since other processes expect the colors to be unchanged. This read-only or read-write attribute is attached to each color entry (often referred to as color cell). A colormap object defines translation from a color id to a physical representation that is a triplet of red, green and blue components. However, these logical color ids cannot be chosen arbitrarily, especially when you use the the system's default color map. The color id (often referred to as 'pixel') is an index of a particular color in a color map and Xlib chooses one of free indices for a shared color when allocation is requested. Therefore, there is no way, for example, to guarantee many levels of gray colors to be allocated contiguously or to begin from the first (zeroth) index. From the viewpoint of applications, more logical color naming is needed. For example, a number of gray levels should be referred to with their brightness as indices. A ray trace program may wish to assign contiguous indices to a group of colors of different brightness defined in HLS model. To cope with this problem, EusLisp's colormap provides another translation table called LUT (look-up table). For a logical group of colors, you can define a LUT and attach a symbolic name to it. More than one LUTs can be defined in a colormap. LUT is an integer vector for the translation of application specific logical color indices into physical pixel values that the Xserver can recognize. gets RGB values for the specific pixel number. this method is the same as :store nil r g b. A new color cell is allocated in this colormap and is assigned with the specified RGB values. sets RGB values to the pixth color cell. :Store is the lowest level method to set a color in a color map. In the first form, you specify the color with the red, green and blue components between 0 and 65535 inclusively. In the second form, you specify the color by name like "red" or "navy-blue". If no such color-name is found, nil is returned. Pixel is either an integer which is the index in a color map or nil. If it is integer, the color cell must be read-write-able. If it is nil, a shared read-only color cell is allocated. :Store returns the index of the color cell in the color map. stores the color specified in HLS (Hue, Lightness and Saturation) model in the pixth entry of this colormap. If pix is NIL, a shared read-only color cell is allocated. :Store-hls returns the index to the allocated color cell. destroys this colormap and frees resource. looks up in the LUT for the id'th entry and returns its pixel value. LUT-name is the name of the look-up-table you defined by :define-LUT. allocates num color cells in the private color map. Each element of rgb-list is a list of red, green and blue components. Color cells are allocated for each rgb value and an integer-vector whose elements are pixel values is returned. Colors described in rgb-list are allocated, and an LUT is registered by the symbolic name of LUT-name. In order to define private color cells, set private to T.
allocates levels of color cells that represent linear gray scale colors and returns LUT. For example, (send x:*color-map* :define-gray-scale-LUT 'gray8 8) allocates eight gray colors in the system's default color map, and returns an integer vector such as #i(29 30 31 48 49 50 51 0). Physical pixel values can be inquired by sending the :pixel message, for example, (send x:*color-map* :pixel 'gray8 2) returns 31.
defines an LUT for shrunk RGB representation. For example, if red=green=blue=2, totally color cells are allocated. allocates count colors using the HLS model. Colors of the given hue (0..360), saturation (0..1), and different levels of brightness between low-brightness and high-brightness are stored in the color map. A LUT named LUT-name is also created. allocates count colors using the HLS model. Colors of the given brightness (0..1), saturation (0..1), and different hues between hue-start and hue-end are stored in the color map. A LUT named LUT-name is also created. returns all LUT list defined in this colormap. Each entry in the list is a pair of the LUT-name and an integer vector. returns the name list of all LUT in this colormap. returns the integer-vector (LUT) identified by name. returns planes of this colormap. associates this colormap to the xwin window. This colormap is activated when the cursor enters in xwin. frees a specific color cell addressed by pixel, or all the entries in LUT. initializes this color map with cmap id. All the LUTs registered are discarded. creates a new color map object. defines a color in the RGB model. Use setf to assign value to each slots. The RGB values are sign extended and the greatest value is represented as . returns the red value of this XColor. returns the blue value of this XColor. returns the green value of this XColor. returns the list of red, green and blue values of this XColor. finds the visual-ID of the specified type and depth. Type should be either :StaticGray, :GrayScale, :StaticColor, :pseudoColor, :TrueColor or :DirectColor. Usually the depth should be either 1, 8 or 24.